I have windmill (with foiling unit), which had perfect hairline registration for more than 5 years. One day this press started picking up paper to deep and I can clearly see how sheet bounce back by hitting the top of the side guide. Well I have added cheaters and thought that they will solve my problem. When I do tests, by hand turning flywheel, registration is perfect, but when I try to run on the engine I get miss-registration (even on slow speed). I thought that is because electrostatic. I checked wiring and grounding, everything is ok. Also another windmill just next to that one registers ideally. I have read all threads on BriarPress about miss-registration, I tried almost everything, but nothing helps. Please write somebody, who had solved similar problem. Why such problem happens one day? Why one morning press simply decides to pick up and deliver sheet differently? Is Your Packing and Tympan drawn tight and without little high spots or crooked, holding the stock off occasionally/intermittently,? Are your grippers level? You can remove all your packing and look at how they sit over the platen. You should be able to slide a 6pt spacer underneath them, I believe. Mine are old and little out of whack so I was struggling with registration like you describe. The gripper was sitting too close to the platen and it wouldn’t let go of the paper like it should..and sometimes the paper would pop out at the last minute, bouncing like you described. Have you checked the front stand of the feed pile to make sure it hasn’t moved? Thank you for your input, really appreciate that! Dear @mick Tympan is really tight and even, I have changed it and even tried to add little printing powder on the top. That not helps. Dear @AnnieW I checked grippers, they seems are even too far from the platen. How did you aligned them to place in proper distance? Just by bending? I have changed grippers, took pair of them from the press which has perfect registration, but that does not helped. Dear @frank how front stand of the feed pile possible to be migrated? No it was not moved, and I would be happy to move it forward, but there are no space for such adjustment. Make sure your your head guide is not all the way forward as the sheet can be forced into it causing a bounce back. At times I move my tray side guide in a little. If the stock comes into the lay guide to tight and gets pushed before the gripper lets go it will swim. The same is true about being to far away as the sheet has to drop into place from to far out. Frank is right about the front lay it must be square. If the front lay was tilted off center and you used the cheatters the stock may be to far out of position to register. The lay and head guide cant always fix the an untrue sheet feed. I found I have a hard time feeding a square sheet with guides. I use 1 to 1.5 ratio and it works fine. I cant feed a 4 x 4 but I can feed a 4 x 6 fine gripping the short side. Good luck you have some very smart folks that have answered your question already with good info and I am not one of those. I have learned that when things go wrong it is not always the press, it is generally me trying to make it do something it dont want to do. 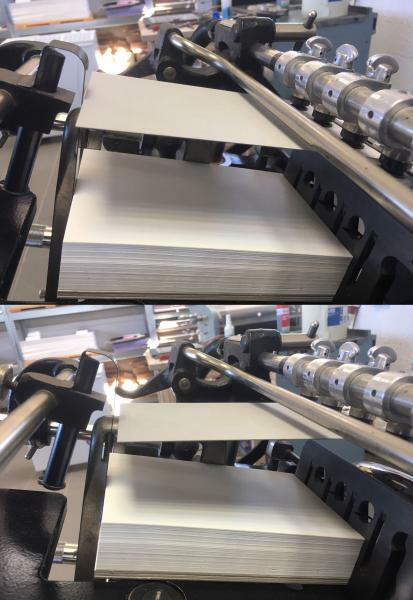 One other thought, recently when printing heavy stock, the stock was being creased by the side lay and that was due to the sheets having a slight wave rather than being perfectly flat. Because of the wave the sheet was riding over the lay . If you have the attachments and enough space in the non printing area you might be able to use the frisket which is really intended to help release the sheet after printng but might help before as well. Also I have found it better to have the side lay set to the centre position rather than too close to the platen. Hope this helps. Thank you guys for the input, really appreciate that! Will try to add thinner cheaters on the front lay (glue some polymer strips), will test and let you know about progress. BTW miss-registration happens on different weights of stock. Seems that I have moved forward in solving this bouncing problem. 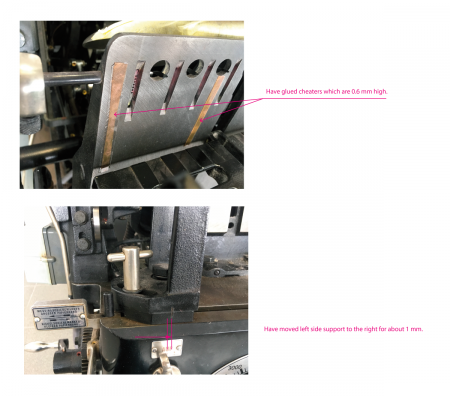 I have glued thin “cheaters” on the front lay and moved left paper support to right side, check out attached image (bigger image you can see here https://cl.ly/ac6726a1553c). I didn’t print work with really tight registration, but I tried foil one color and seems that every impression goes in same place. Anyway my question leaves unanswered - why, why one day that happens? Why grippers suddenly, without any reason, started to pick up paper too deep? And perfect, almost new, press stopped work like it should work. @bppayne how you do gripper tilt? Maybe you mean suction unit tilt? Is it any possibility to tilt front lay to front side? You say picking up to deep which does not make sense . Make sure your suction bar is not bent and the tension nob is tight. If running using rubber suckers try taking them off. Try adjusting your paper height to the point where it just picks up and no higher and then control it with the sucker tilt. If the paper is to high at the point of pickup it can cause a problem. There is a knob in the bottom photo showing the support. Make sure that nob is all the way clockwise and stays tight. My nob can move on it’s own which affects suction and I have to check it always. I don’t use cheaters with registration as the sheet arrives in the wrong spot. Feed a sheet part way into the press with each gripper bar and test pull it to make sure it is evenly tight on both bars. If they feel different the sheets may be slipping to much as they feed and the registration systems cannot correct it. Watch to see that the feeder sheets are not drawn up and held by the sheet seperators. While that may cause the feeder to misread and stop, it may also continue and place the sheet forward of where it otherwise might go “biting deep”. Ensure, as you have already checked no doubt, that the paper curl all goes one way. Problem still persist. Seems that each second sheet bounce (check out this image https://cl.ly/0dd37f153338). But I doubt that such small difference can be a reason of bouncing problem. I don’t see a guide on the right side of the stack. That may cause your sheets to kick a little. You dont need to run the right guide to tight but I always still put one in place to hold my sheets in a ready position. Try working with a very minimum amount of the strippers showing. You should be able to get by with 2. With a heavy stock you may not need them at all. Run at the slowest speed possible and watch your paper stack. You want to see if the sheet are ready to be picked up and at times speed can disrupt the next sheet to be fed and put it in a poor position for pickup and may cause it to misfeed. Try putting a paper wedge behind the stack. The idea is to lift the back of the sheet so as the suckers picks up the stock it makes it easier for sheet to level out before going into the press gripper. It may just be me, but I run a wedge or 2 behind every stack. You should see less drag as the stock pulls into the gripper and the stock is less likely to try to drop back off the suckers. Make sure your back springs are not to tight as it can fight the stock as it picks up. I always use 2 to hold the sheet square. I set an angle with the springs guides facing away from the top of pile as it is picked up. Make sure your spring guides don’t face into the pile above the pickup point as they might cause tension to the sheet to pull of the sucker after if has been pick it and try to knock it back off or release momentarily from the sucker. I took of guide from right side of the stock to take better picture. Looks like that on higher speed less bouncing. Author - Worked hand in glove, with Heidelberg Platen & Cylinder Minder (machine manager) since early 60,s. When He is loading His stock, he not only >knocks it up<, prior to loading, but with blocks of less than 3/4” taps them gently with the Heels of the palm(s) into perfect contact with the forward Stanchion. of course with both side stanchions and usually as many as possible/practical Pen Steel separators. Occasionally (with tricky stock) in the process of loading, He takes small blocks of stock 3/4” (ish) or 1/2 a ream and between both hands, (like a croupier bridging the deck of cards before dealing) puts some *AIR* into and between the sheets, appears to give better separation and aids the blast under. ?? Plus (once in a Blue Moon ?) have seen a fine braided, Copper Tail, hanging over the back edge of the stock to conduct the static away to earth, exactly as occasionally happens with small Litho press,s Multilith, Gestalith, Hamada, etc., etc.